My younger brother and his girlfriend of 7+ years are finally getting married. While they’ve spent a large chunk of their lives together, they’ve never lived together and are only recently starting to delve into each other’s finances. Oh, to be young and naive again. Because we knew nothing about each other’s finances before we got married, it led to a lot of arguments our first year of marriage. Of course, in the end it worked out, and my husband and I have now been married six years and understand money management a lot better. But we could have avoided a lot of heartache. 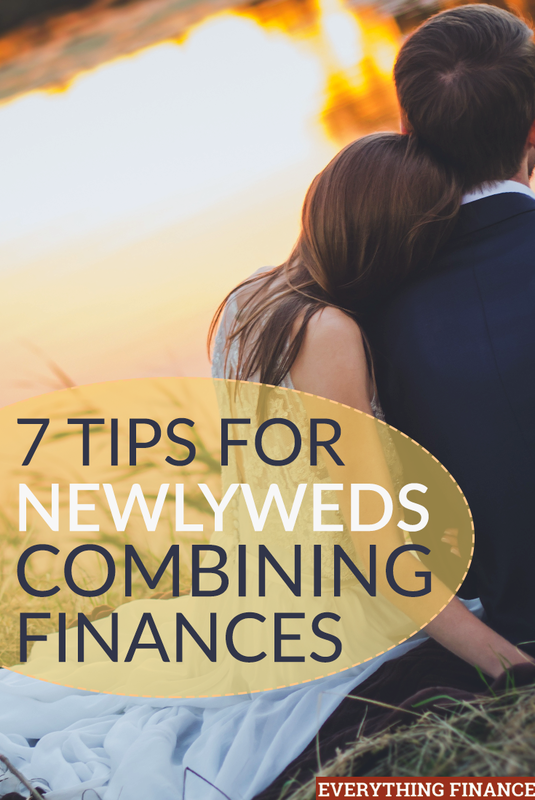 Here are some pieces of wisdom that I shared with my brother and will now share with you for newlyweds looking to combine finances. How much debt do you both have combined? I found out my husband had about $2,000 in credit card debt a little after getting married. Then he found out that I still had about $20K of student loan debt. If you’ve already gotten as far as deciding that you want to get married, you need to have a serious conversation about how you’re each going to pay off your debt. If you’re looking to make any big purchases after getting married, such as a house or a car, you will each have to have good credit in order to get the best possible deal. If you wait to find out your partner’s credit score, you could be in for a huge (unpleasant) surprise if you find out that their score is much lower than yours–greatly affecting your monthly payment. It’s time to figure out how much it’s going to cost to live. While you may be able to save money since you now (most likely) have two incomes, you want to make sure you don’t go crazy with spending or set yourselves up for a lifestyle you can’t afford. You have to talk about your finances. Discussing money makes a lot of people uncomfortable, but it’s absolutely imperative to have open communication so you avoid unnecessary arguments. Set an amount between you and your partner that is the limit of what you can spend without consulting the other person. For my husband and me, it’s $100. $100 isn’t a huge amount, but it’s enough that it could impact our finances, and if my husband is spending that much, I want to make sure it’s worth the impact. My husband has an account that gets a certain amount of money transferred to it every payday. He is allowed to use this money any way he chooses, and I don’t get a say. This has solved a lot of issues in our finances. When do you want to buy a house? What kind of retirement do you envision? Do you plan on paying for your children’s college tuition? These are all expensive financial goals that require a lot of planning and saving. Make sure you’re both on the same page, and never ever assume your partner has the same ideas as you do when it comes to money. What other financial tips would you give to newlyweds? Is there anything on this list you wish you knew when you got married? Discount on car insurance for being married?